For each instance in which New Ling Tong discard equipment cards in his equipment area or for each instance in which New Ling Tong discards two or more hand cards during his discard phase, New Ling Tong can select up to two cards owned by other characters and discard them. Much like the original Ling Tong, New Ling Tong cannot simply discard equipped cards in order to activate "Whirlwind." He must either have another character forcibly remove his equipment or he must replaced his equipped cards with another equipment card of the same type. "Whirlwind" activates on a 'per-instance' basis. If New Ling Tong loses multiple pieces of equipment in one instance (such as when Wu Guo Tai targets him with "Exposure"), this ability can only be activated once. Likewise, if New Ling Tong discards more than two cards in his discard phase, this ability is only activated once. When New Ling Tong activates "Whirlwind," he can discard any two cards owned by other characters. He can choose to discard two cards from the same character or choose two characters and discard one of each of their cards. New Ling Tong cannot discard pending delay tool cards when he activates "Whirlwind." "Whirlwind" is a great deterrent to prevent enemies from discarding New Ling Tong's equipment. When they target New Ling Tong's equipment with a Break or Steal, they will lose two cards, whereas New Ling Tong will only lose one. New Ling Tong's "Whirlwind" is improved over the original Ling Tong's analogous power because it can now be activated when he discards two or more cards in his discard phase. This is useful when New Ling Tong can do nothing else during his turn. 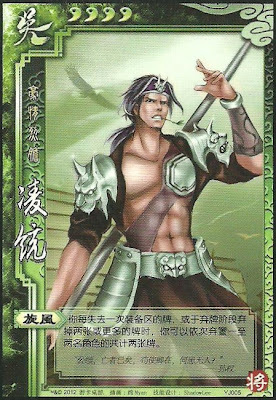 "Whirlwind" is useful to New Ling Tong when he is targeted by Capture and when there is nothing that he can do during his turn, as he draws two cards in his drawing phase then must discard two cards in his discard phase to activate this ability. While New Ling Tong's "Whirlwind" is easier to activate than the analogous power of the original Ling Tong, it is still difficult to activate on a consistent basis. Losing equipment can sometimes be difficult to do. Also, Ling Tong will probably not be able to do anything in his action phase if he wants to activate "Whirlwind" in his discard phase, as he would have to save up enough cards to have two additional ones in his discard phase. If New Ling Tong has few hand cards during his turn, it become difficult for him to lose two cards in his discard phase to activate "Whirlwind." Xun Yu/Guo Jia/Liu Bei/Xu Shu - These characters can give New Ling Tong cards with their abilities. This helps him find pieces of equipment that can be used to activate "Whirlwind." Guo Jia and Liu Bei are better than the other two when paired with New Ling Tong since they know what cards they are giving him and the can ensure that they are giving him equipment, but Xun Yu and Xu Shu are still very helpful. Wu Guo Tai - Wu Guo Tai can use "Exposure" to force New Ling Tong to swap his equipment with another character. Realize that New Ling Tong can only activate "Whirlwind" once per use of "Exposure" no matter how many pieces of equipment are swapped, but the fact that he can use this power on a consistent basis with the help of Wu Guo Tai is not something to be overlooked. Zhang Zhao & Zhang Hong/Chen Gong/Zhang He - These characters have abilities that allow them to give other characters equipment. This can be very helpful for New Ling Tong. Additionally, Zhang Zhao & Zhang Hong's "Stabilization" can be used to keep New Ling Tong's hand full after his discard phases, making it easier to activate "Whirlwind" in subsequent turns by discarding excess hand cards. Sun Jian/Sun Ce/Gan Ning/Jiang Wei - These characters have abilities that can force characters to discard cards. Sun Jian and Sun Ce's "Brave Spirit" allow New Ling Tong to choose which cards he discards, and he can choose to discard equipment to activate "Whirlwind." Gan Ning's "Surprise" and Jiang Wei's "Instigate" can be used by them to forcibly discard New Ling Tong's weapons to also activate "Whirlwind." Zhang Chun Hua/Zhuge Liang/Lu Xun - These characters have abilities that activate when they run out of hand cards. This gives them a defense against New Ling Tong's "Whirlwind." King New Ling Tong is not the best king choice. He seems to be more of a support character and he does not have abilities that will give him the longevity to last for a long time as the king. Loyalist New Ling Tong is a serviceable loyalist. He can use "Whirlwind" to destroy the rebels' cards. Specifically, he can destroy their weapons and -1 Horses to prevent them from reaching the king. Rebel New Ling Tong is a good rebel. He can use "Whirlwind" to deplete the king's cards. Spy New Ling Tong is a serviceable spy. He can easily gather pieces of equipment and the other characters will be reluctant to remove them from his equipment area. Also, as the spy, New Ling Tong can simply end his turns without doing anything. If he discards two or more cards in his discard phase, he can activate "Whirlwind" to even the teams in anyway he sees fit. New Ling Tong is an improvement over the original Ling Tong. Unlike several of the 2012 SP characters, this improved version seems to be better-balanced. When using him, try to acquire equipment cards at every possible chance. Additionally, weigh out your options during your turn. If there is not much that you can do during your turn, consider doing nothing and discarding two cards in your discard phase. Remember, New Ling Tong can discard any two hand cards (including those that are not useful to him) to discard two important cards from enemies. This is a very useful way to get rid of an enemy's equipment.